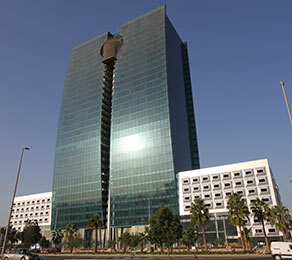 King Road Tower in Jeddah contains 36 floors of combined commercial and office space, a health club, two underground parking areas and a shopping mall at ground-floor level. The designers asked CCL to provide a solution which would maximise space whilst still allowing architectural freedom within the tower, creating a large open space for this landmark project. CCL optimised the design, using the benefits of post-tensioning, which allows large spans even where high loadings occur. The load-balancing techniques used in the post-tensioned design minimised the number of beams, providing greater flexibility of layout for the location of services in the final fit-out. CCL utilised the design experience of its design company, CCL Engineering, which employs over 100 engineers. The company can ensure that even large and complex projects can be delivered within short timescales. CCL slabs produced savings in both time and material, compared to traditional construction methods. The thinner slabs reduced the amount of concrete and reinforcement required, whilst faster installation enabled formwork to be stripped and redeployed more quickly. Quality was assured throughout the process, with CCL Engineering undertaking the design and CCL providing coordination. All components were supplied and controlled by CCL’s UK manufacturing division.